The 510ET sweeper is a battery powered pedestrian sweeper that can fulfil any requirement of the industrial, commercial and services sectors. The front loading system and easy-to-adjust brush pressure guarantee a high standard of hygiene and a constant cleaning quality on any kind of surface, form tiles to asphalt and concrete. 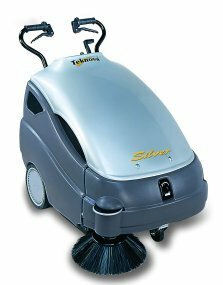 A powerful drive system enables large surfaces to be cleaned with ease thus saving valuable labour costs. Thanks to the ease of use, simple waste bin emptying system and easy manoeuvrability, the 510ET sweeper can be used by anyone. The ergonomically designed controls mean ease of use and complete the magnificently designed new generation of Teknova sweepers.